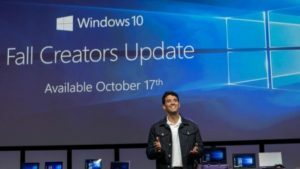 Microsoft announced Windows 10 Fall Creators Update back in May at the Build 2017. Today at an event at the IFA 2017 it announced that the update will roll out starting from October 17th. It also announced that the Windows Mixed Reality headsets will start rolling out from October 17 when the Fall Creators Update ships. The update will bring several new features including Fluent design system, better experiences such as Cloud Clipboard that will improve the experience of moving content across Windows, iOS and Android, OneDrive Files on Demand, new apps on the Windows Store — including iTunes, and world’s first Windows Mixed Reality motion controllers with no markers required. Pick up where you left off: Log out of one device and Cortana asks if you want to continue working in your app, doc or website on your next device. Clipboard: A fast, easy way to copy and paste just about anything between connected devices by allowing copying from the desktop and pasting on a phone. One Drive Files On-Demand: Lets you save all of your creations in OneDrive Files On-Demand, accessing your cloud files like any of your other files on your PC, without using up your local storage space. Updated Game Mode: Allows your games to use the full processing power of your device, right from a new button on the Game bar. Windows Inking: Will let you ink directly onto PDF’s, making it easier and faster to comment and share with others. Smart Ink applies artificial intelligence to inking automatically making the squares you draw more perfect, or turning boxes into a table. Windows Story Remix: Uses AI and deep learning to organize and transform photos and videos into stories powered by Microsoft Graph to connect users across devices. Eye Control: Implements eye tracking technology that lets you type, and operate a mouse just using your eyes for those with Lou Gehrig’s disease. Travel back in time: Timeline lets you jump back in time to find what you were working on, whether it was 2 hours or 2 months ago. Easily hop back into your files, apps and sites as if you never left. Windows Defender: To get smarter and defends better than ever before. With behind the scenes cloud intelligence that enables new defenses against ransom-ware and exploits.